Don't worry. I am not about to sing. I do have some compassion. The very nice postman delivered a lovely surprise today, which slightly disappointed me as I was really looking forward to using the word "postal" somewhere in this post (pretty tricky how I just did that, eh? *Smirk*). However, he was so efficient and so fast that I had hardly any time to react before a spongy, ochre-coloured package was pressed into my hot little hands. Glancing at the sender's label, I knew immediately what it was ... my prezzie from the Most Magnanimous and Wonderful Bloke in the World (er ... besides you, Graeme ... phew, good save) aka Brendon of Something in Season! A week or so back, this kind, generous man offered up three of his cookbooks to three of the fastest fingers in the land. I modestly profess that I was one of the three fastest draws in blogdom. 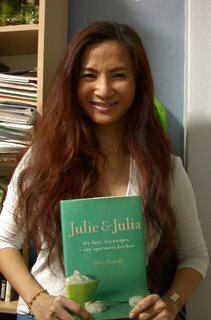 And scored myself his copy of Julie & Julia! I am beyond thrilled. I'm one of those people who never wins anything! If there were 10 lucky draw prizes at a dinner and dance, and only 10 people attending it, everyone would have won one except me while the last remaining prize would have instantly combust before being bequeathed to me. So this was a wonderful treat. It was like Christmas all over again! Brilliant! I'm slightly embarrassed to confess to a girlish squeal as I unwrapped my book. The bright green of the jacket cover and the photography was admired as well as Brendon's elegant scrawl to wish me joy in reading the book. I promise you I will, dude. I already started reading but am only up to page 78 and that is because I was helping 3A Gurl with her move today. So thank you, thank you, thank you, Brendon. You're a good man. On another tangent ... tonight, 3A Gurl, 3A Hubby and I had a lovely dinner at my favourite pizza place, Spizza. While I was savouring my wonderfully crispy slice of basil pesto, pine nuts, olives and cheese pizza, we overheard the long suffering waiter deal with the interrogations of three young women at the next table. "Does the Pamela have chicken? Is it safe?" "No it does not have chicken. All its ingredients is listed in the menu, ma'am. So yes, it is safe." "OK, what about the Claudia, does it have ..."
And so it went for each and every item on the menu! Finally the beleagured man pretty much lost it. "Everything here is safe, ma'am. Everything!" The poor, poor man. I truly felt for him and really wished those three silly and highly annoying women would fly the coop. I was just amazed he did not go postal on them (Eureka, I did it!) as he remained unswervingly polite. I would have directed them to the nearest KFC myself. Right, off to bed a very happy camper with a new book to read ... now, Martha, that's a good thing. Cool photo. I see that the book is in good hands! You realize that you've now become a lucky person. Might I suggest a few lottery tickets perhaps? Very fun seeing you in the photo. Your hair is wonderful. I think Something in Season is a great blog. Hey Bea - Thanks! I wuoldn't be too optimistic about the luck thing ... it's probably a fluke. Anyway, technically, I won it by being fast and sucking up to Brendon so it was not really lucky, just superior brown nosing. So was Julia Powell like what you expected on air? I must admit I knew she swore a bit and the book had some profanity but I still had some raised eyebrows reading it. Ilva - Want me to make up a fake contest that I will rig to let you win? Kalyn - Thanks so much for such diplomacy to substitute the word "scary" for "fun"! And the hair ... really? That lion's mane that I cuss every day? Go figure ... And yeah, Something in Season is one of the sites I visit daily besides yours. How far are you into the book? I read thus last year expecting it to be a bit crap etc. It was great, very funny, upretentious and unfody whch was refreshing. It brought me back to earth. Unfody? LOL. Well, I am still at Page 78 as I realised I have to return the Louis de Bernieres I borrowed this weekend so I am frantically trying to read all 799 pages of it! So far, I am finding Julie & Julia very funny. Perhaps it's because I am more Asian than I thought but I was a little surprised at the amount of profanity and in-your-faceness. 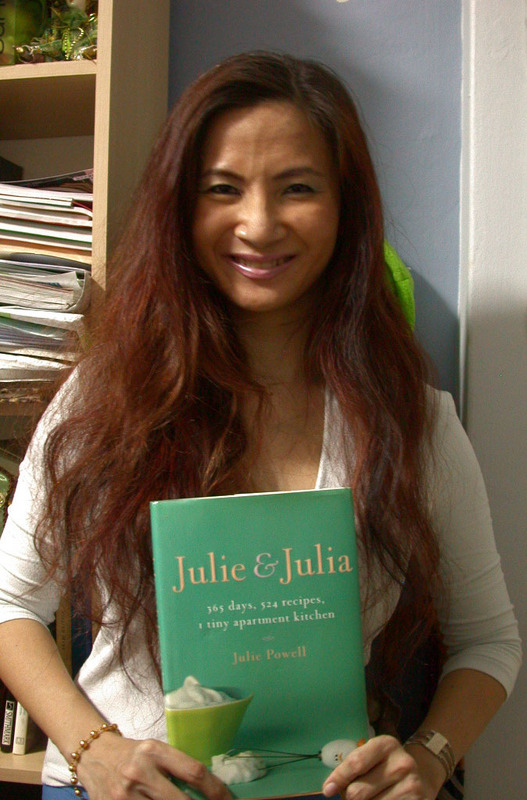 But I think that is part of the charm of Julie Powell ... she is unapologetically New York, even if she was originally from Texas. I'll write a little review when I am done but yeah, I am enjoying it. Bad spelling or typing. Unfoodie of unfoody, my fingers are too fast and unprecise. You are right about the swearing it adds to the charm. Which Louis de Bernieres.